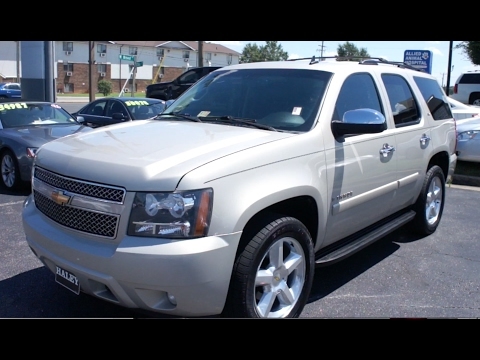 If you have a number of children, tow a boat or horse trailer and like the feel of a substantial V8-powered vehicle, the 2008 Chevrolet Tahoe could be just the ticket. Another plus: The Tahoe's powerful V8 engines offer Active Fuel Management technology and many are E85-ready. The Chevy Tahoe handles well in snow and water. I have 4 wheel drive and use it a lot in the winter to get around. My airbag light is on. There is a recall but been waiting 2 years for the part. The 1st year I had it the bottom rear passenger door collected water inside door and rusted. The cord for the rear defrost has been glued back on at least 3 times (is now off). I had engine problems. Snow builds up on the bottom of the windshield making it difficult to see out. The Chevrolet emblem fell off. In the third row seating one of the seats will not come up making my car a 6 passenger instead of 8. My check engine light is on because the fuel pump is leaking fumes, which I had replaced twice. Other than that it has over 16,000 miles and still running so I gotta give it that! Fancy white paint job with a luxurious look! I love my Tahoe!! It is roomy and comfy. It is not too big or too small. It fits me and my family. It feels luxurious to me and I like sitting up high. The leather seats have warmers for cold weather and the sunroof is great for warmer weather. I love the back up safety features. The 3rd row seat comes in handy when we have lots of kids to carry. I have had 3 Tahoe’s and have actually taken a 900 mile trip in the one I have now. It was very comfortable and I would absolutely do it again in a heartbeat. I know I have at least 250, 000 more miles to go before it gives out on me. It is a flex fuel model so when gas prices are high I have a alternative. My vehicle 2008 Chevy Tahoe has been great over the last ten years. It is dependable, when the weather is bad I feel safe driving the Tahoe. It is a flex fuel vehicle so when gas prices are high I have a alternative for fuel. The biggest problem I have is since the dealer warranty is no longer in effect the cost of repairs are so expensive. But the cost of repair compared to a new vehicle is still cost effective. The vehicle has over a 150k miles and still drives like new. This is my second Chevy Tahoe and I would buy another one.